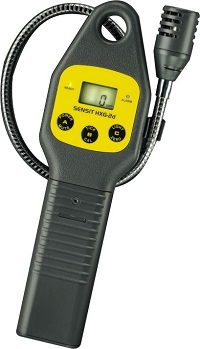 This combustible gas detector has a precise tick rate control to assist in locating those hard to find leaks, a digital display that reads both concentrations of LEL and parts-per-million of the combustible gas sensed. Warning LED's and audible alarms alert the operator of impending hazards. A push button data-logging feature allows you to print out the results of a gas leak test and calibration data to an optional printer or PC. Detection of gas occurs at the end of a flexible gooseneck allowing easy pinpointing of a leak source. The sensor samples the air continuously and does not require a pump or a hand aspirator. Accessory probes with hand aspirators provide gas samples from remote locations or manholes.